When I was a kid, reading was my thing. I rollerskated a bit, and could occasionally be forced outside to “play,” but I was happier sitting somewhere with a book than doing anything else. But one thing about books confused me. When I went to the library or to a bookstore, I noticed book covers first. I noticed that I was drawn to some covers more than others. I noticed that not all covers were created equal. I’d heard the phrase about not being able to judge a book by its cover—except that I could. I felt so sorry for adults for believing that book covers didn’t matter. They so clearly did. Luckily the book industry finally figured out that the aphorism, at least when it comes to actual books, is completely bogus. Which is why I started worrying about the cover for The Black Hour before it was entirely normal to do so. I have some background in graphic design and, though I don’t practice it much anymore, I used to make a living that way. I can still be called upon for quick projects if necessary, but I prefer to leave design to those who are truly talented at it. But having some little bit of interest and maybe even a smidge of talent in design has left me, if nothing else, ridiculously picky. When Seventh Street Books began to show interest in my book, I went straight to their website and checked out their wares. SSB is a small publisher, and small publishers have to overcome a few things that the big five don’t. But I was reassured by a couple of things I saw. First off, I recognized a couple of their books from their marketing efforts. Good news. And second? They had astounding covers. In short order, one of SSB’s talented designers, Nicole Lecht, had designed a dark, brooding cover with a university-specific setting for my dark, brooding university-set mystery. I was pleased. My agent was pleased. My cover turned up on SSB’s quarterly catalog to their distributor. I had business cards made. I ordered fridge magnets, too. I bought—nerd alert!—a skin for my cell phone with my cover on it. I’ve heard the stories. Covers are not the purview of the author. Decisions get made without their input, and sometimes against it. I feel lucky to have had such a thoughtful design given to my book. See that little glare on the “O”? That is my Grinch heart growing three sizes for the love of this cover. Someday soon, my book is going to be on the shelf at the library and at bookstores. When I think about that, really think about it, I get a little light headed. I feel like I’m ten again, on rollerskates, going a little too fast. I’ve wanted to write a book just about that long, actually—since I was a kid, reaching for Judy Blume, for E.L. Konigsberg, for Agatha Christie and Mary Higgins Clark. Reaching for a book with an interesting cover, and hoping it’s as good as it looks. I knew a writer who had a contract with a small press, and this issue — that she had no input into the cover design — was one factor in she and the publisher deciding to part ways. She’d even commissioned a cover herself, from an artist she liked, and they declined to consider it. So, she self-published instead. I gathered that she found that to be a much more satisfactory arrangement. Glad it worked out for her. I was hoping for traditional publishing ( I don’t have time for doing all the EVERYTHING yourself, the way self-published authors have to), but I certainly understand how a bad cover could be a deal-breaker. It’s been such a relief to be so well taken care of in that department. I laughed at your Grinch comment. Funny girl. 🙂 And I love your cover–it’s intriguing, dark, and beautiful. Looking forward to reading! Thanks, Heather! Fun topic for the week, I think. I want photo proof of your cell phone skin! I *almost* did a selfie with the phone camera for my image for this post, but I just really don’t like to take photos of myself, so…yeah. I chickened out. Bok bok. 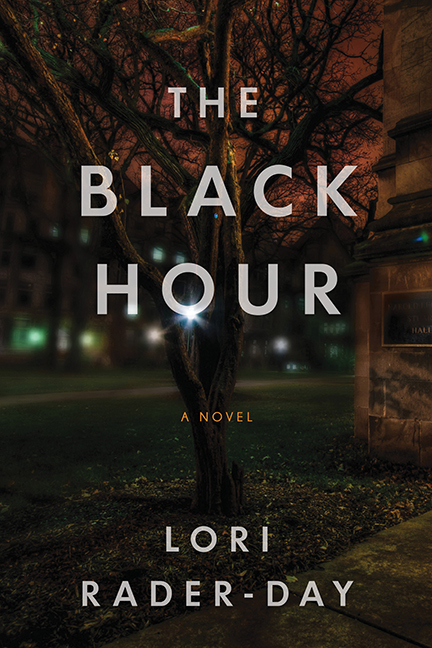 I love the cover of THE BLACK HOUR. I worry about this, too, but am keeping the faith–I like my publisher’s covers too, and have heard from a friend at the same house that we do have some input. I’m pretty sure if you could get a jpg of it, Vistaprint could be compelled to print it on any substrate you can hold down long enough for them. Thanks, Julie! I love your cover and can’t wait to read your book! I love the little glare on the “O” — it’s little details like that make a cover. I love your cover. I want a phone skin of my cover! Where did you order? I so want a magnet! You shall have one, then! Glad to know it can be done! And that I’m not only one crazy enough to do this. I LOVE your cover, Lori. And I agree that the little glimmer in the O is just amazing. It’d be a completely different cover without it (funny what a difference the tiny details make). My phone type didn’t have a hard case available, but I got a skin for it for $10 including shipping! Sold! I snorted at the Grinch line, too. Great post. Can’t wait to see the book on shelves. Your cover is super cool and enticing. I can see why you love it. Congrats! You and I have lived parallel lives, I think. I got my BFA in graphic design, used it for a very little while, and then went into teaching. However, I have enough design training to make me hyper-critical and judgmental, so book cover design is a big thing for me when picking a book, and always has been. Luckily, reading recommendations also go a long way, so if a book doesn’t grab me with the cover, the writing will usually win out in the end. It just might take a little longer. What I hate is when some of my favorite books get a NEW cover, one I like LESS. So much harder to convince others to read it! Your cover looks amazing, and sounds like the kind of book I’d stay up late to read. Can’t wait to buy it. Congratulations, and thanks for contributing to this blog – the five of you are such an inspiration to those of us who are trying to follow in your footsteps. Thanks, Julie! My first degree was in editorial design—newspapers, magazines, etc. But I have just enough of an eye to make me anxious about someone else designing something for me. I’m letting that go, because people who’ve made their lives about design are so much better than I ever would have been! Thanks for reading! I love this cover too, Lori. I’d wanted to read your book long before I saw the cover, but the cover definitely took me in hook, line, and sinker. Like you, I love book covers and I’m definitely drawn much more to some than to others – and I can’t wait to own this one!